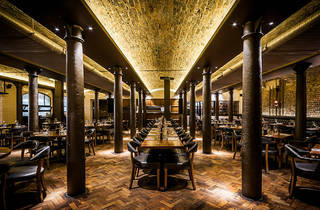 Most Londoners will have heard of Hawksmoor. Since the first opened, back in 2006, it’s been the darling of the steak scene. That original branch is near Christ Church Spitalfields, built by architect Nicholas Hawksmoor – hence the name – and is a full-of-character but smaller space. But this Covent Garden offshoot, launched in 2010, just as the area was becoming fashionable again, is the group's well-deserved flagship. Set in a big, buzzy basement, with low, flattering lighting, it’s great for a long lunch, a birthday dinner, a hot date and everything in between. A converted brewery, it's hugely atmospheric, with plenty of original features including the gently arched brick ceilings and cast-iron columns. As for the food, it’s still great. You can’t really put a foot wrong here, and though the beef is of course excellent, it does a mean line in seafood, too. On a recent visit, a slice of toast buried under an avalanche of delicate white crab meat was a hit; as was a skin-off, on-the-bone monkfish swimming in garlicky, herb-flecked butter. Don’t overlook the huge selection of sides: they’re stars in their own right (especially the moreish cauliflower cheese). One tip: you'll find standard steaks on the menu at any time, but to get your pick of the larger blackboard cuts before they’re crossed off, you’ll need to arrive early. 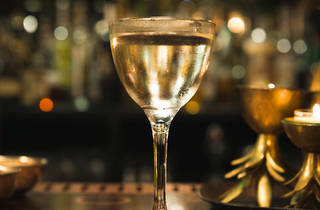 All the better to sink a few killer cocktails and settle in for the night. 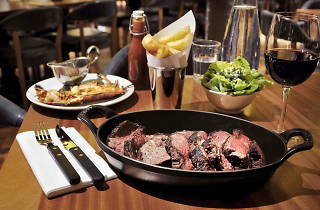 Dinner for two with drinks and service: around £140. had 850gm ribeye with bone in,shared for 2 of us,without doubt best chunk of meat we have ever eaten !! service and atmosphere excellent, lovely place. Hands down the best steak in town. And it's not just the food, everything about this place is classy - from the service to the decor to the cocktail menu. We went on a Sunday after a recommendation and we're not disappointed. We took a long time trying to choose our meals but all changed our minds the instant we saw a roast being served on the table next to us. Very tasty we'll cooked beef with a generous veg portion and huge Yorkshire pudding. Very good waiter service reasonable prices for wine. Beware we got there just after twelve and the place was totally full when we left at two. Going back soon and looking forward to another great roast. With low ceilings and dark wood, this large space has a masculine vibe. The service was excellent throughout from ordering the wine to choosing the food. The fillet steak was succulent and cooked to perfection. It was also big but at £36, it should be. The cauliflower cheese and creamed spinach were cooked to perfection. Because we decided on no starter, we had a twenty-five minute wait but we had been forewarned. Too full to have dessert, we ordered the salted caramel rolos. Quite wonderful! It's not a cheap meal out but it certainly is memorable. Great place for a date, steak was wonderful. Don’t miss the field mushrooms, absolutely gorgeous, and my boyfriend was very impressed by the grilled lobster. Friendly, unpretentious, quality. Don’t underestimate the size of the steaks though. They’re priced that high for a reason and we came perilously close to wasting good food. Best roast I have had in London and a reasonable price too! Hawksmoor is one of those places you worry that you will end up spending quite a lot of money in (and if you're not careful you do) but a roast with all the trimmings for £20 a head is not bad at all, and the best roast I have had (don't tell my mum). The beef was perfectly cooked even though you can get beef wrong so easily and all of the veg was fresh. Will be going back for a hungover roast very soon! Absolutely the first place to go if your travelling to London! The staff is is so refreshingly cordial and exceptionally amazing.. from them leading us to our table, taking our order, service and even when we were leaving was a great experience. And the cherry on top with being treated so well was the food! We ordered Sunday Roast and macaroni and cheese which was out of this world.. filled us to the brim. We were then contemplating whether to have the dessert as we were so full with the tasty food, when we decided against it.. our servicer knowing we were tourists insisted that we have the British experience before we leave and on the house gave us the sticky toffee pudding and it was so good! I'm glad we had it! Even after that when we were leaving, at the reception/cloakroom area, although she whispered to keep it a secret, she saw my umbrella was broken and offered me another one to use! With all my travelling and visiting different restaurants this is in my top of the top list! A friend recommended this place to find the best burger in London. While the burgers were very good the jury is still out on if this is the best burger in London. The waiter was very friendly and offered to make any cocktail you wanted even if it was not on the menu. The bar had a nice vibe. A place I look forward to trying again to explore more of the menu. I like the athmosphere and decoration. A friend recommended the burger and they were really tasty and some even had a different twist which surprised me. The cocktails were good but a bit overpriced for what you get. Overall, it was a nice evening. A bit on the pricy side, but if you want the most delicious, melt in your mouth steak then head to Hawksmoor. It's a real treat to go, so get your glad rags on and spoil yourself. I went the whole hog- wine, starters, mains and cocktails. One tip- none of the mains come with sides, it does state this on the menu but when I went I overheard the couple next to me moan about the fact they had only got a steak. Read the description. Cannot fault the food at all, and to end on the best espresso martini I have ever had was the cherry on top of the steak. What a fantastic to go for steaks, Sunday roast and French dip sandwich! It is situated in a hidden location on Shelton street, the restaurant is in the lower ground level. I don't mind it so much because they make it look spacious and trendy. It was a great place to try the food, I think its a bit overpriced for what it is, but the steak was nice. I think I prefer OTHER steak places in London. The chips were over cooked , I sent them back and they brought over cooked chips again, I wasn't very impressed with the service either. Love Hawksmoor in general but finally got round to going on a Sunday and trying out the roast which I'd heard such good things about. For £20 it really isnt much more than the average pub roast these days and it was absolutely impeccable. Beef is cooked on the spit over charcoal first and finished in the oven, you have the choice of ordering pink or well done (I'm a philistine and went well done, dont judge me) everything is cooked perfectly and tastes great but doesnt over power, the meat and gravy is left to do the talking and its just delicious. Large portions but not gut busting too. As ever the service is ideal, relaxed and attentive, really helpful with the wine menu (as slightly hungover useless people this was very much appreciated) the staff arent pushy either so if you want to dip your toe in the world of Hawksmoor the roast is a good budget choice, you'll never turn back. Start and end with a cocktail if your budget allows, there is an extensive menu and I'm get to find a bad egg on there. I'm a vegetarian, and can honestly say it was one of the best dining experiences I've ever had. My best mate is a hardened meat lover and so I thought there would be no better 30th birthday present than lunch at Hawksmoor. From the moment we walked in, the service was impeccable - picking up early it was my friend's birthday, giving us free desert to celebrate, calculating our bill so we got the best available deals on the day. I can't speak on the steak front, but if there's any worried veggies out there - their side dishes were delicious as was the gnocchi vegetable dish that I had. Cocktails were lethal and wonderful to boot. Went for lunch last week, and attentive service was complemented by great steak (highly recommend the fillet steak). We took the waiters advice for the wine and were not disappointed!. Proved to be a great place for lunch so highly recommend it! 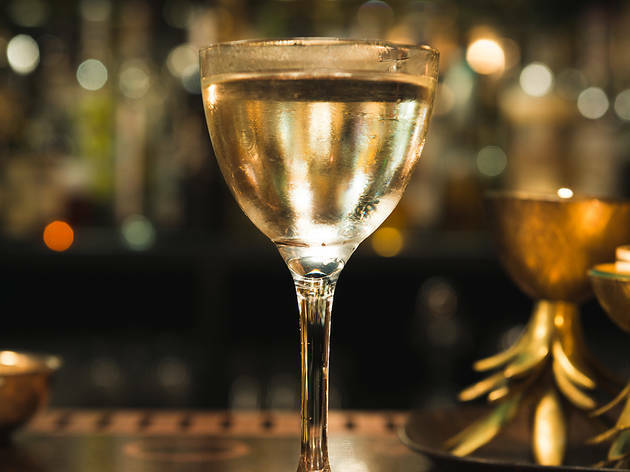 I made a last minute booking only to be told that they only had seating in the bar area, when we arrived I was pretty pleased about this as the main restaurant was brightly lit and heaving with work parties whilst the bar was quiet and dimly lit; making my dinner more intimate. On this particular occasion I ordered the pre theatre menu and was pleasantly surprised. For £22, you can have a choice of two courses and the menu is small but very straightforward and not too fussy. The roasted beetroot and goats cheese salad was light but filling enough when shared between two people. The rump steak available on the set menu was huge, delicious, and cooked to perfection alongside the chips fried in beef dripping which were the perfect accompaniment. The staff were very helpful but a little pushy at times. However when the bill arrived and we remarked at the price of some wine we'd had, our waiter quickly removed a significant amount from the total cost! Steaks are certainly outstanding, very attentive service, good decor, hence the high rating. However, I would not go back. There is something about the place that does not feel right to me. Maybe the private members club style entrance followed by a not particularly classy menu and atmosphere. Wow. Just wow. This place is absolutely fantastic. When you first enter, you're greeted with friendly and polite staff who offer to take your jacket and put it in a cloamroom - always nice to not have it draped over the back of your seat whilst eating. It was my birthday, and my partner had arranged for a glass of prosecco each when we first sat down, which was really lovely. The menu is extensive and delicious. If there's something you don't understand, the staff are always hapyp to explain everything to you. 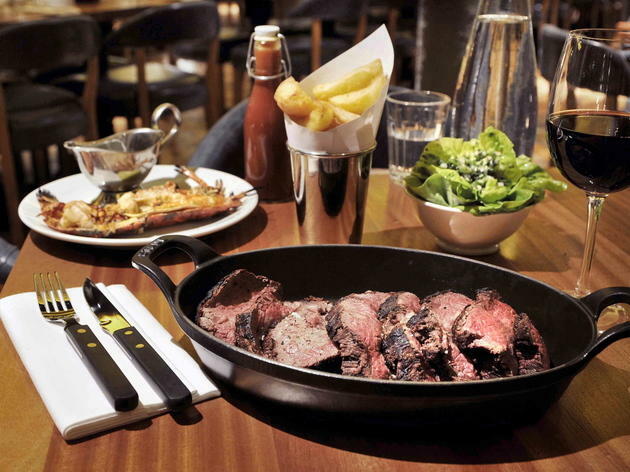 The steaks are on the pricey side, but not overpriced for London, and for what they are. I went for the fillet steak, and so did my girlfriend, which were both around the £30 each. We then chose mac and cheese, fries and veggies to accompany it. The food came in good time, and it was nice and hot. The waitress also brought us some bone marrow gravy for free, because 'it's so nice that I don't want you to miss out on it!'. She was right - it was absolutely delicious. My partner had also arranged for a birthday cake for me at the end - this wasn't just a slice of cake - it was an entire cake of deliciousness, which was big enough for about six people. What makes it even crazier, is that they turned around to us and said 'this (the prosecco and cake) is on the house - happy birthday!'. What a lovely birthday surprise, and totally unnecessary as my girlfriend knew how much it would cost, but it reallly did make my birthday even more special than it would have been! We've booked again for February! This restaurant never fails to deliver on the quality and taste. The Porterhouse is always perfect for sharing and the mac and cheese is a great side. The fact it's below ground level makes you feel like you're a world away from the hustle and bustle of Covent garden. Best steak EVER! The cuts are amazing. The service is good and the cocktails are nice, but a bit pricey. Always packed on the weekend and can be difficult to get a table, if you love steak you will not be disappointed. Absolutely faboulous tasty food and lovely drinks with good environment. Hawksmoor never disappoints. The ribeye is always outstanding as is the creamed spinach. If you're after one of the best steaks in town then look no further. Best steak in London! The sides and desserts are also fantastic, as are the wine and Tamworth belly ribs. The Seven Dials restaurant has the best atmosphere. It's all about the meat! Such great steak and brilliant fro a Sunday Roast too! Infarct I'll be going here tonight! Absolutely loved it in here. The food is amazing. It is quite expensive and the kind of place you end up getting at least starters/mains and several cocktails! But still so worth it. The service is impeccable and atmosphere is great on, what seems to be, any night of the week. Best steak in London! I visited Hawksmoor Seven Dials for lunch a few weeks ago. The atmosphere is relaxed and quiet at lunch, perfect for a business lunch or catching up with a friend. I got the bone marrow and fillet steak as part of the two course prix fixe lunch menu. Both were delicious, but the bone marrow really stood out as my favorite. Great quality and such a fine taste! I had been wanting to try this place for a while as its burgers are touted as some of the best in London. I ordered mine medium rare…and received a burger that was extremely well done. They're not cheap so I pointed this out to the waiter, who to his credit sent it back and ordered me another one. A really stylish interior, excellent service and the potential for great meat- I would go back as hope this visit was a blip! Over rated. Great venue but have found the service inconsistent. I've sent a steak back because it was so salty it burnt to be told the chef disagreed and offered an unseasoned steak. I left. One of the best steaks in London served with some of the nicest sides available. Service is always on point and the bill isnt as much as you would expect for such a high profile and well regarded restaurant. Will definitely go back again and again. I love this place, it has the romance of old fashioned flicks. The cocktails are killer the rump steak my fav. The staff are understated and make you fel t eas not achingly try hard cool. I’ve yet to try the Sunday Roast- high on my list! One of the best stakes you can eat in London. There Porter House is amazing. Good friendly staff. There breakfast is also supperb but you will need all morning to get through it! This place has really incredible food, and I would recommend it to anyone who values a nice steak. The service is alright, sometimes it has been great and other times it has been below average. One time we were trying to grab a quick pre-theatre drink in the bar and the concierge pretty rudely told us that there wasn’t even standing room in the bar at the moment. We couldn’t see if this was true or not, but it’s a pretty big bar so I think there probably would have been space for 2 women for a quick wine. Anyway, when I’ve dined here I’ve always had really excellent quality beef and sides. Food was excellent as expected but there wasn't a great atmosphere. Went at lunchtime so perhaps it's buzzier in the evening. Can definitely recommend the yorkshire pudding starter but you need a big appetite! Having been several times, it has never won me over. Average all round. Plenty of other places serving great steak, and far better atmosphere. A shame not better. 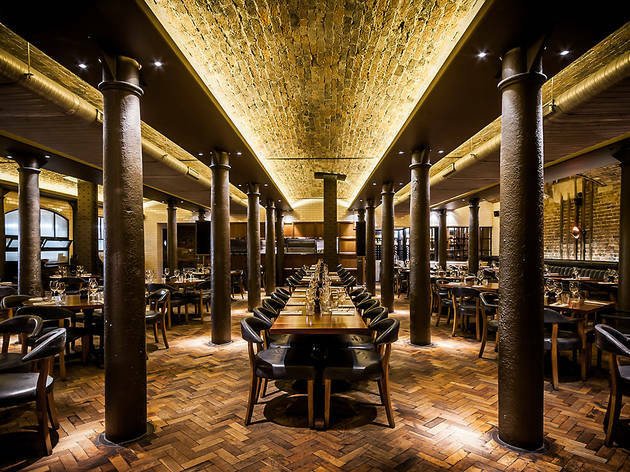 I doubt anyone needs to read another positive review for Hawksmoor - but apart from the fantastic food and drink, the way we were treated was just exemplary. Every group in the restaurant near us - ranging from ageing city bankers to the beardy shoutalots in the corner were treated as if they were the most important customers in the place. The Steak is awesome - It's a toss up between here or Goodmans for best in London - Hawksmoor edges it for me. - service is always top notch, a great setting and it's easy to lose time in.Great buzz too. Must try a shaky Pete's shandy and save room for the puddings which is difficult I admit! Quite simply the best Sunday lunch in London. It may be pricier than your average roast in the local pub but the extra four or five quid is worth it. Generous portions, relaxed but attentive service make this a treat worth doing regularly. Poor in just about all respects. Expensive, poor value for money (£65 per head for 2 courses ) , tired and unimaginative decor , noisy , dark basement location. The steak was served just warm and was nothing special in terms of flavour or tenderness , the vegetables at £4 each were miniscule and not very tasty. How this restaurant has supposedly managed to get more than one star is a mystery. The irony is that for a steakhouse we found the best part of the meal was the salad and the fish one of our party had. Never commented on a restaurant before so you can tell I was not impressed by this one. In London for a mini break with the wife (we're from up north). We both had the fillet steak, medium & medium rare, both were cooked to perfection. The best we've ever had, chips were really nice, would recommend the 2fried eggs! Enjoy! The Hawksmoor Seven Dials may be a good restaurant, but when it comes to cater for a group of 10+ they got it completely wrong. We went there to celebrate a birthday party, 11 people in total, mixed group. Food and service good, but the system of having to choose a menu before going so that everyone eats the same is just useless. The waste of food was tremendous, and the steaks got cold very quickly because they were served as pure lumps of meat in trays that let the heat out very quickly. The bill was over-expensive for what we actually ate, and this is not due to lack of food, but due to lack of a proper system to cater for a large group. The all inclusive menu is a waste of food and money. If they had a normal a la carte system even for groups of more than 10 people, it would be great. Attended the " feast " last night , roasted bones , meat that melts in your mouth and PROPER CHIPS . . . !!! There was mention of a dessert menu . . . no need . . . not in my case ! Waitress saved me from ordering " half-a-cow " and was very good , the service was the cherry on the top . . . The location is magnificent , looks like it is a well-established Victorian club . . . MAGNIFICENT , cant wait for my return . . . I had lunch yesterday with my family there. We all had the sunday roast and it is possibly the best roast I have ever had. The meat was to die for!! We also had starters and desserts and everything was fantastic. Really good service. Definitely going back asap! I've had a lot of steak in my time, and to be honest I thought you couldn't really discern much difference between nice steak and great steak. That's because I'd never tried a porterhouse steak at Hawksmoor. It was so good I think it's what tastebuds were invented for. Also, anywhere that writes a cocktail menu with such flourish and dedication deserves a hearty 'cheers' from me!